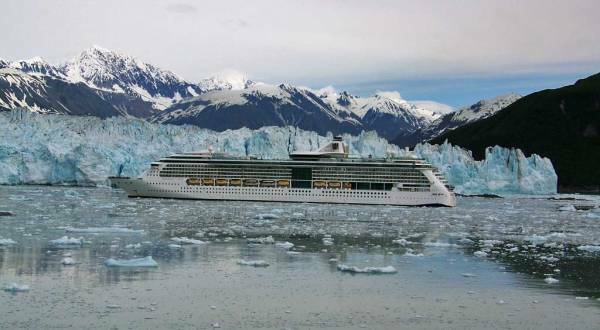 The only way to get to Hubbard Glacier is by cruise ship, because it is so very isolated. The Hubbard Glacier is in the Gulf of Alaska on Yakutat Bay. The glacier is almost half way between the lower Alaska Panhandle coastal towns and the ports on the Gulf of Alaska near Anchorage. 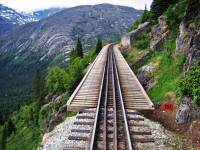 You can’t get to Hubbard Glacier by car and no airports are nearby. As we approached Hubbard Glacier, a small boat brought a nature guide who boarded our ship. 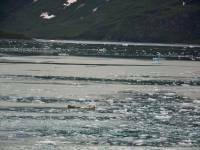 After the guided boarded, we entered the portion of the bay that was thick with small pieces of glacier ice. 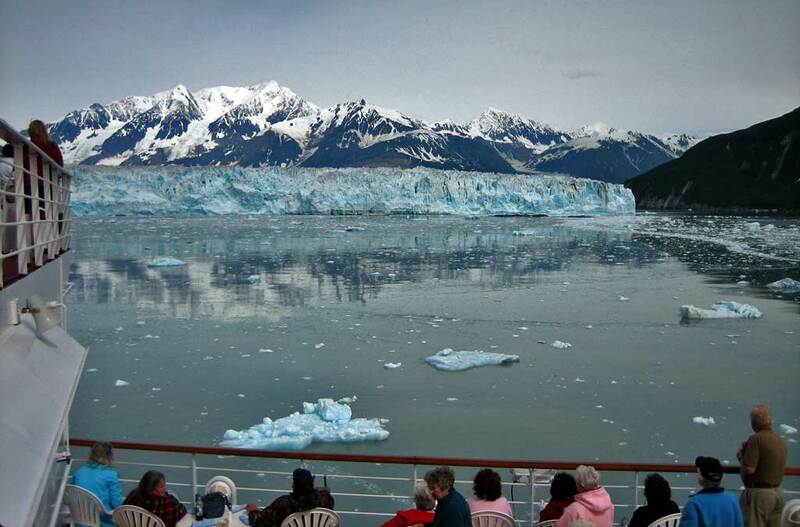 The Hubbard Glacier is over 70 miles long and drops directly into Disenchantment Bay on the Pacific Ocean. Disenchantment Bay is a small bay on the larger Yakutat Bay. 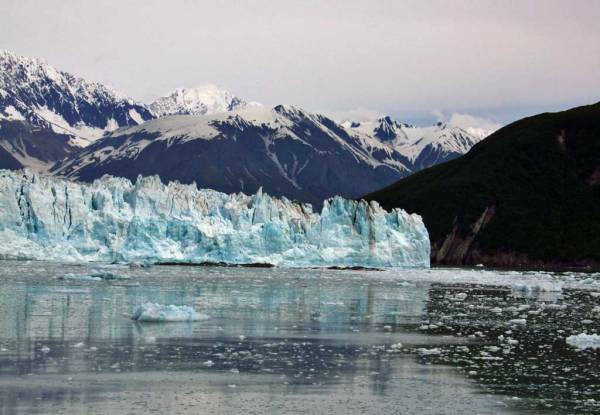 The glacier is 300 feet high and more than 6 miles wide when it enters the ocean. The glacier ice has beautiful blue spots in it. Right beside Hubbard Glacier is the Turner Glacier, which also enters the Disenchantment Bay. The Turner Glacier is colored dark by rock and sand mixed into the ice, so it looks completely different from the blue ice beside it. The name Disenchantment Bay refers to the disappointment of early explorers when they found out they wouldn’t find a Northwest Passage through the bay. The floating pieces of glacier ice in Disenchantment Bay crackled, hissed and popped as we made our way through to the glacier. Although I was amazed as how close we got, the Radiance of the Seas went even closer. The Radiance of the Seas seemed to be too close for safety, when their ships horn blew several times. Their captain was trying to make the glacier ice calve off a landslide of ice by using the vibration of the ship’s horn. This day wasn’t a good one for major calving, but we did see more than a half dozen minor cascades of calving ice. 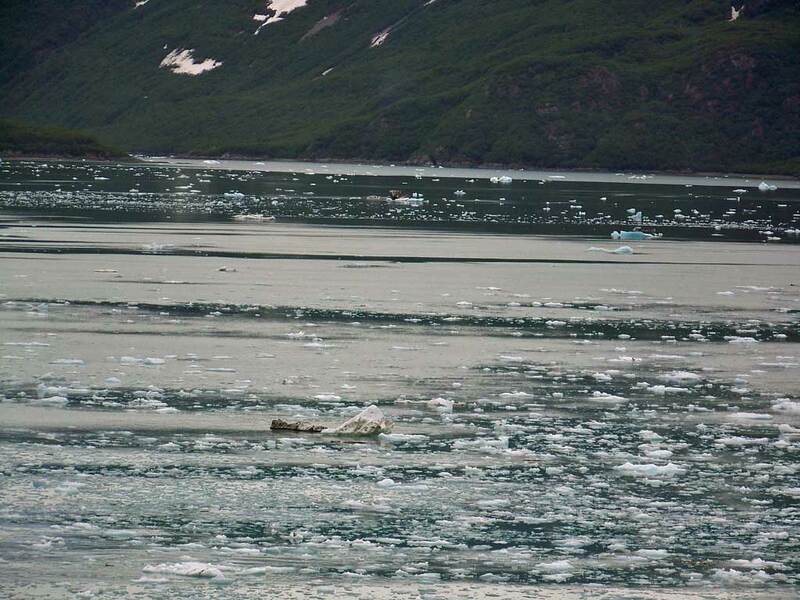 The glacier ice fell from a height of about 50 feet above the ocean. The ice cracked and produced a sound like cannon fire or a good mid west USA thunderstorm. 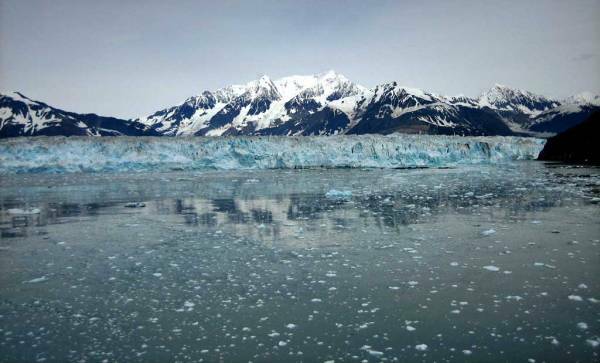 A great experience at the Hubbard Glacier Ice!